As environmental historians, our frequent assertion that “humans are a part of nature” often comes with little recognition of the fact that slave owners, eugenicists, and a variety of other white supremacists insisted on the very same thing for generations before we first noticed a trouble with wilderness. 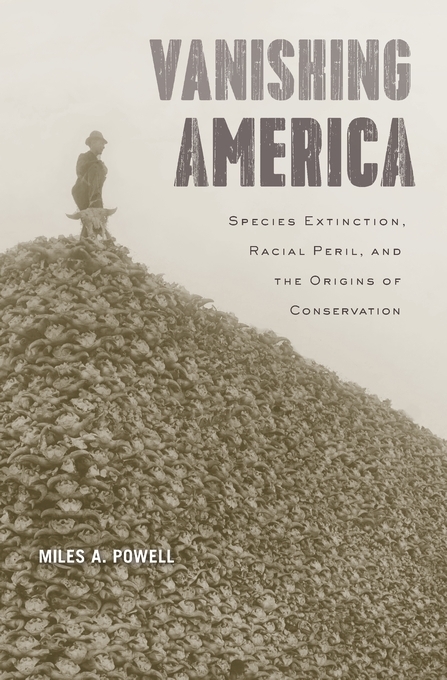 Miles A. Powell’s Vanishing America directly assesses the converging project of American race-making and American environmentalism over the last two centuries, and it does so with sophistication and uncompromising clarity. 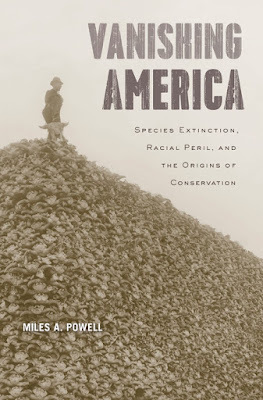 The troubling stories that Powell uncovers implicate many of the founding figures of American environmental thought within a tradition of white nationalism that positioned the problem of species extinction as a symptom and symbol of America’s racial degeneration. Far from existing at the fringes of national discussions over the historical relationships between humans, nature, and extinction, Powell reveals how ideas about race rested at their very center. George Perkins Marsh, for instance, in the decade after the Civil War, claimed that the Anglo-Saxon race reached its zenith in America as a result of “pioneer experiences” that wrought civilization from the wilderness, and he feared that this white racial stock would fall victim to its own successes as it continued to consume nature through the nation’s industrial metabolisms. Marsh’s connection between the destruction of animal species and the loss of white racial virility anticipated the more familiar anxieties of “race suicide” penned by Madison Grant, William Temple Hornaday, and Theodore Roosevelt by more than a generation. Likewise, in the wake of the frontier’s passing, Frederick Jackson Turner summoned evolutionary theory in tirades against immigrants to the United States, fearing that the naturally selected adaptations of Jews, in particular, to endure “the unsanitary and indecent conditions of a dangerously crowded population,” equipped Jewish immigrants as a sort of invasive species, able to outcompete and exterminate native-born Americans, despite being “a people of exceptionally stunted and deficient lung capacity” (p. 53). Even Aldo Leopold’s classic statements on carrying capacity and predatory–prey relationships come under Powell’s insistent scrutiny, as a final chapter demonstrates the centrality of Leopold’s scholarship to the neo-Malthusian human ecologies of extinction proposed by his friends, William Vogt and Paul Ehrlich. These and other stories provide ample evidence of the significant ways that ideas about race informed ideas about the environment, and, in particular, how white anxieties about species extinction aligned with fears of what the eugenicist, Klansman, and Harvard-educated historian Lothrop Stoddard termed, in 1920, “the rising tide of color.” By the middle of the twentieth century, these white supremacist concerns over race and nature carved, according to Powell, “an enduring divide between America’s environmental movement and the nation’s non-white citizenry” (p. 163). For more on this topic, see here and here.